In an effort to make a future work together with LeBron James, the Miami Heat's Dwyane Wade, Chris Bosh and Udonis Haslem will opt out of their contracts and become free agents, league sources told Yahoo Sports. While Bosh, Wade and Haslem could ultimately take less money with the early termination outs in their deals, James, the NBA's four-time MVP, is seeking a full maximum contract extension – or something close to it – to stay with Miami, sources told Yahoo Sports. James is eligible to sign a five-year, $130 million extension with the Heat. James' priority remains to find a way to make a future work with Miami, but a failure by the organization toward improving the Heat's roster to his satisfaction could send him aggressively into free agency, sources said. Bleacher Report first reported the opt-outs. 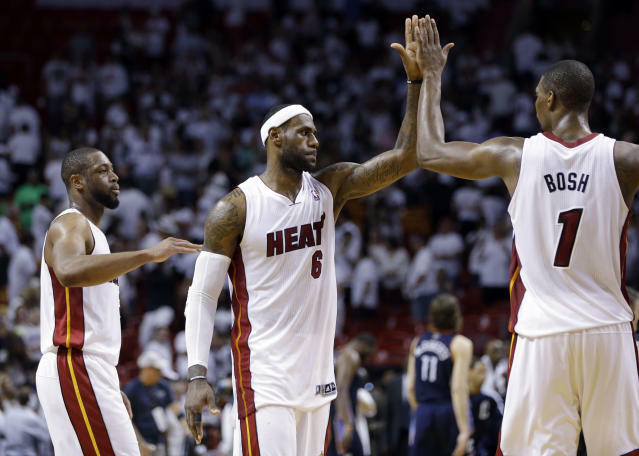 Bosh, Wade and Haslem had Monday deadlines to make decisions on exercising the options. James' teammates want to work with Miami president Pat Riley on re-signing with the team at lower financial figures that would allow management to retool with the roster with upgraded talent. Because of James' value as the best player in the NBA, the Heat players understand James' desire to seek maximum contract value, sources said. Bosh has two years and $43 million left on his deal. Wade has two years, $42.5 million on his contract. Haslem has a $4.6 million player option for the 2014-15 season. James will opt out of the final two years and $42.7 million on his contract.